Starting in February, members of the guild are invited to participate in our House Block-Of-the-Month program. For each of nine months, a house theme will be randomly selected and announced during the GQG monthly meeting (Feb. – Oct.). 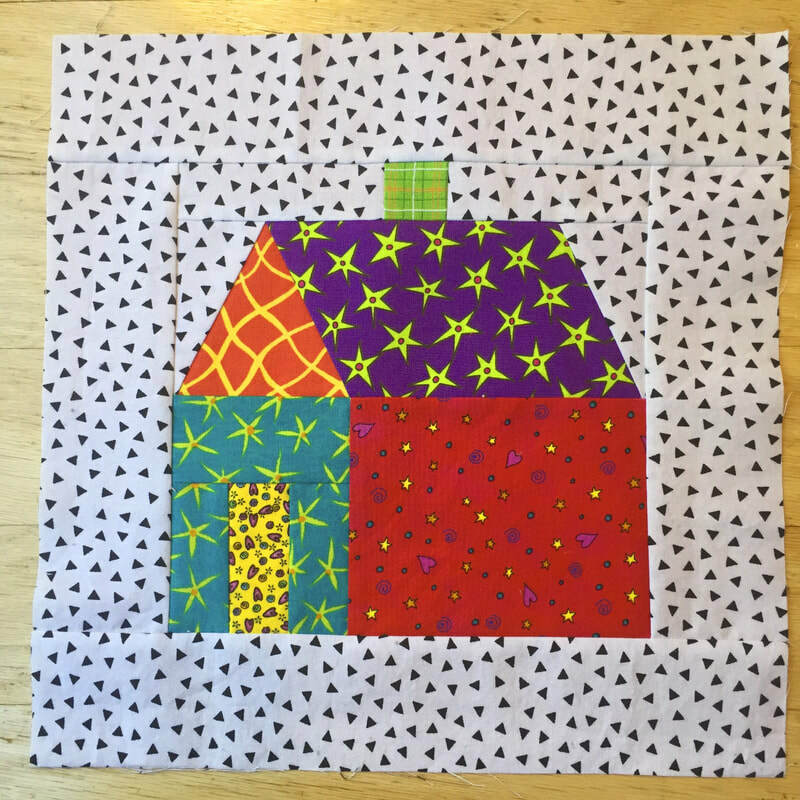 Use any fabrics -- and any embellishments, if you choose -- to construct a house block that finishes at 12-1/2” x 12-1/2” raw and reflects the house theme announced at that month’s guild meeting. A pattern is provided, but it’s your quilt. Feel to tweak the pattern if/as you see fit. Use quarter-inch seam allowances throughout your block’s construction. Bring your completed block to the following month’s guild meeting for display in the BOM gallery that evening (Mar. – Nov.). It will be yours to take home after the meeting. Most of the pieces in this pattern are rectangles and the instructions tell you how to cut out those rectangles. The exceptions are the four pieces that make up the roofline — the front of the roof, the side of the roof and the two triangular pieces of background on either side of the roof. For these areas, you will need to use pattern pieces. Links to both the entire pattern and just the page of roofline pattern pieces are above the photo of the house block in the upper right corner of this page. NOTE: Different printers have different settings. To make sure the page of pattern pieces is printing correctly, whether you plan to paper piece or not, check to see that the outer line around the A/B/C/D paper piecing pattern unit measures 3-1/2” x 8-1/2”. If not, you need to adjust your printer’s settings. Just the roofline pattern pieces. Check out Past 2019 BOMs!